NE&C has developed an easy to use FIRM Comparison Map that makes it easy to quickly see how the flood maps have changed. Click an area on the map to display a pop-up explaining what has changed then read below to learn more. Preferred Risk Policy (PRP) Extension & “Grandfathering” currently offers savings. The National Flood Insurance Program (NFIP) has extended the purchasing of low-cost PRP for two years for properties newly mapped into a high-risk zone. In addition, there are “grandfathering” rules to recognize policyholders who have built in compliance with the flood map or who maintain continuous coverage. However, the Biggert-Waters Act calls for a phase-out of grandfathered rates. This will happen gradually, with new rates increasing by 20% per year for five years. Implementation is anticipated in late 2014. Contact us for more information. We look forward to hearing from you. The property remains in a Special Flood Hazard area and flood insurance is likely required. Federally regulated and insured lenders are mandated, by federal law, to require flood insurance on buildings for which they issued a loan that are located in high-risk flood zones. Changes to the National Flood Insurance Program by the Biggert-Waters Act will likely result in an increase in rates regardless of whether or not the flood map changed. The flood risk and insurance rate may be affected by changes in Base Flood Elevation (not indicated on the FIRM Comparison Map). 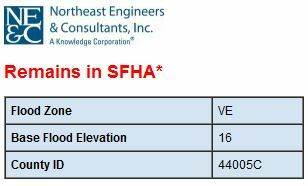 Previous elevations can be found using the RIEMA Floodplain Mapping Tool. 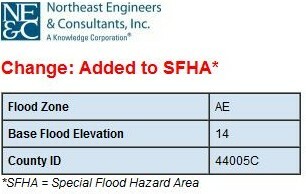 An Elevation Certificate will be required to determine the flood risk. Contact us for more information. We look forward to hearing from you. Flood insurance is now optional. The risk has been reduced but not removed. More than 20 percent of all flood insurance claims come from policies in moderate- and low-risk areas. Flood insurance can still be obtained at lower rates. Flood insurance remains optional. The risk of flood is reduced but not removed. More than 20 percent of all flood insurance claims come from policies in moderate- and low-risk areas. Flood insurance can still be obtained at lower rates. 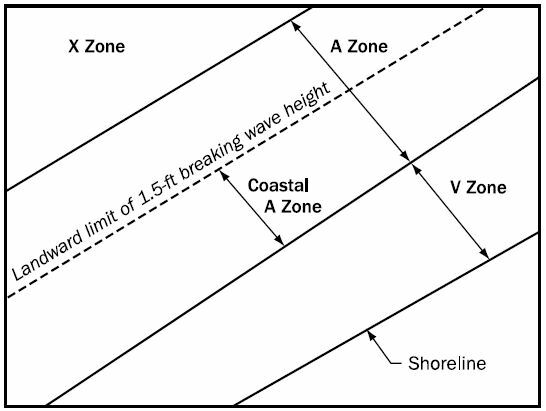 Coastal Barrier Resources System (CBRS) boundaries and Otherwise Protected Areas (OPAs) are established and mapped by the U.S. Department of Interior’s Fish and Wildlife Service. The NFIP cannot provide flood insurance coverage for structures built or substantially improved after the area is designated as a CBRS unit (initial designations went into effect October 1, 1983). Insurance will be cancelled if buildings within the CBRS unit is substantially improved or substantially damaged. Refer to FEMA’s fact sheet for additional information. © 2019 Northeast Engineers. All rights reserved.